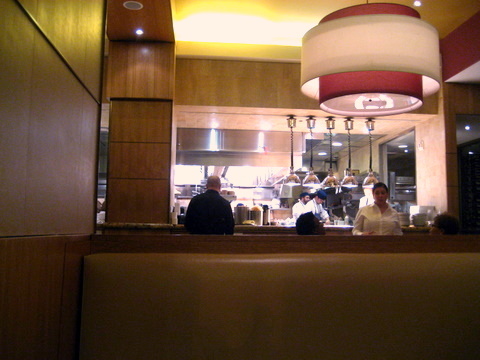 Based on the strength of the previous night's dinner at Citronelle, we felt a visit to Chef Michel Richard's casual bistro, Central was in order. 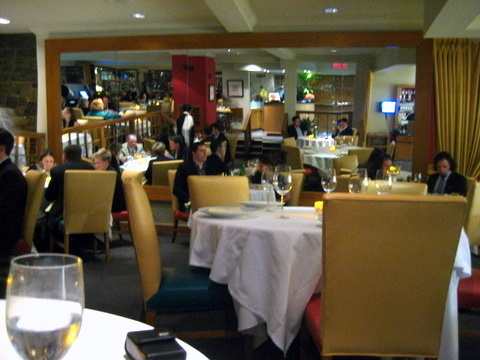 The restaurant is designed in a long narrow space with the main dining room on the left.and the bar running down the right with an exposed kitchen behind it. Functional furniture, neutral wood tones and dark carpet make the room fairly bland, though there are some contemporary flashes such as the purple-walled semi-private area, the see through meat locker, and the glass enclosed wine cellar. 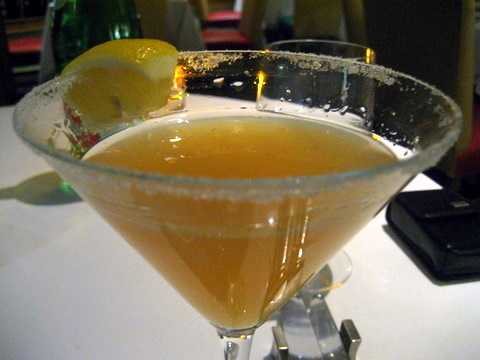 I decided to start things off with a pear 20 which proved to be a too-sweet variation of the Bellini. 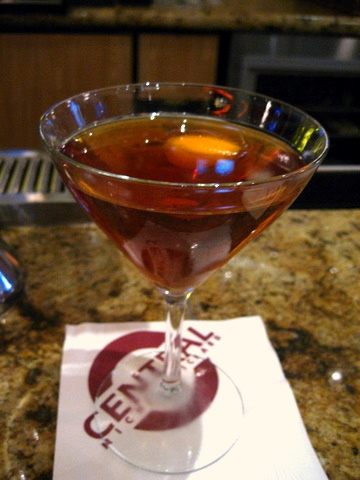 My companion chose The Social, a play on the classic Manhattan; incredibly stiff but with a hint of candied orange rind. A light hued white ale that poured with a fizzy effervescent head; much lighter on the coriander and citrus than most white ales. A Belgian pils that I guess is exclusive to Central; fairly typical in all respects, not bad but nothing that warrants exclusivity. 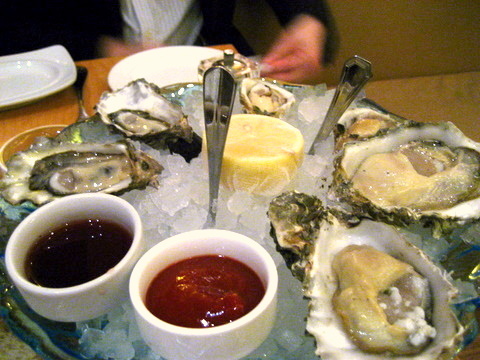 One of the best sets of oysters I have tasted in a while, with each variety offering its own charms. 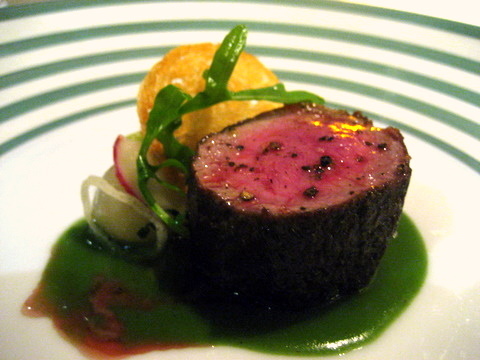 The tiny size of the Kusshi belied its intense flavor, bold yet clean. The thin Hama Hama had a muscular bite and sharper salinity. 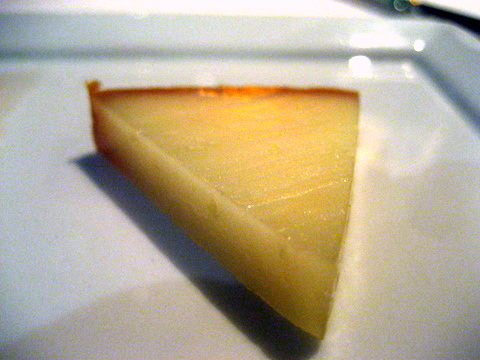 And the massive Penn Cove had a supple meaty texture and mild flavor making it easily my favorite of the three. 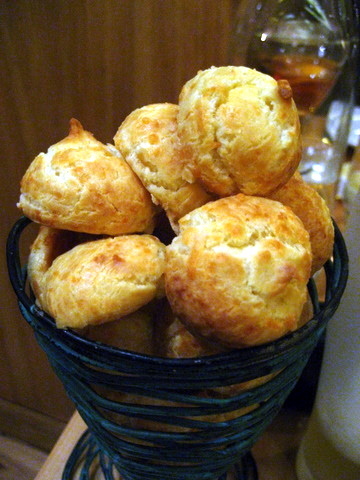 Ah gougères dainty chewy balls of bread and cheese, so simple yet so very delicious; I've lost count of the number of times I found myself wanting a whole bowl of these after having one as a canape or amuse. Happily, Central offers a generous helping allowing me to sate my gougère lust. 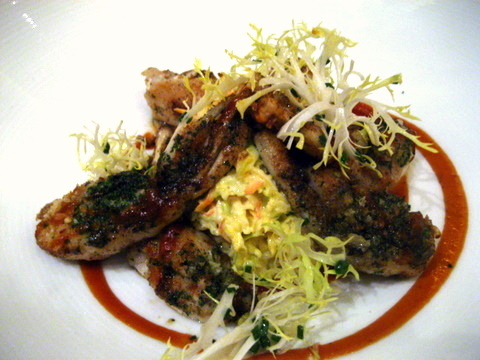 The Faux Gras is easily the most intriguing thing on the charcuterie menu. 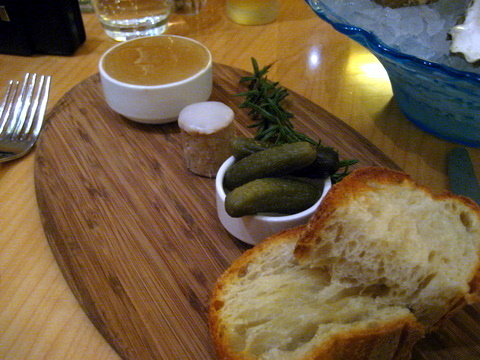 A paté of seasoned chicken liver, the faux gras had a rustic sapor that proved to be better than many true foie gras preparations. The duck rilletes were pretty much what I expected, that is to say superb, the slow cooking gave the meat a braised beef-like tenderness and concentrated the already rich flavor of the bird. 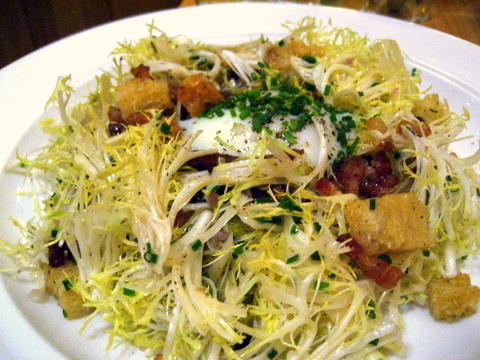 Next up was a traditional French salad, a rustic flavorful combination better known as a Salad Lyonnaise, Initially the dish might seem a bit heavy, but the frisee has an assertiveness that manages to hold its own quite well against the smoky lardons and rich creamy egg. 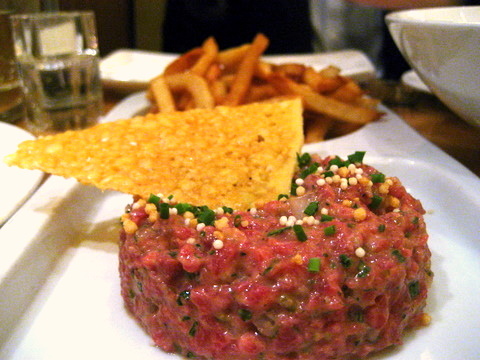 Steak tartare always poses a bit of a dilemma for me, I always feel compelled to order it but end up disappointed as preparations tend to be fairly similar across restaurants. 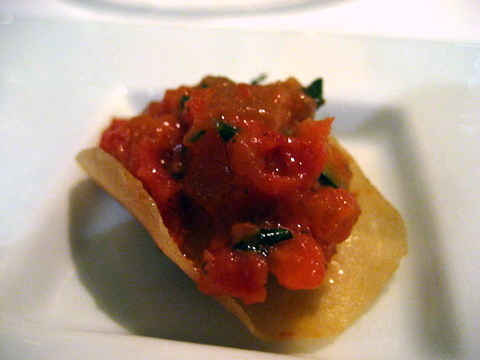 After wrestling with the familiar conflict, I decided to give Central's tartare a try and was very happy that I did. The tender beef was seasoned with onion, pepper, and a creamy mustard that gave it a depth and body lacking in so many other preparations. One of the better preparations of frog legs I have had outside of my parents house. 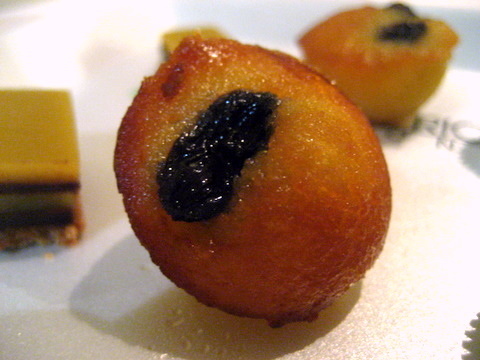 These were sauteed in butter and covered with liberal garnish of herbs. The weighty flavors were evenly balanced by a side of creamy cole slaw and bitter frisee. 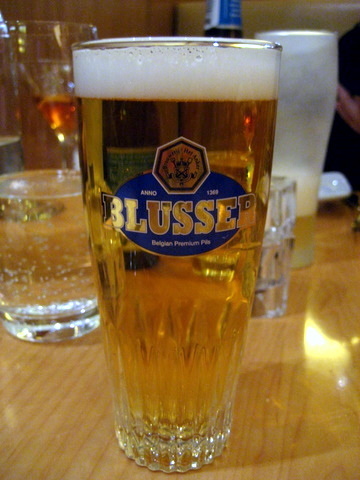 This beer is from the same brewery as the Blusser above, Brouwerij Het Anker and the two couldn't be more different. 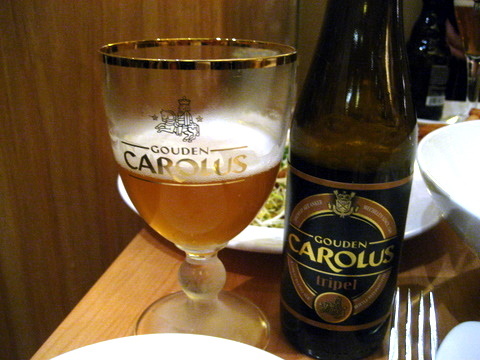 Where the Blusser was bland, the Carolus offers multi-layered aromas of fruit, with sweet fruit and toasted malt on the palate. 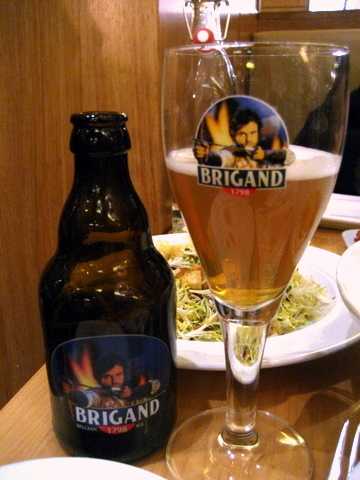 Despite having one of the ugliest labels in the history of beer, the Brigand is a very good beer. The pour is dark and thick with a creamy head; hard to believe this is a pale ale by looks alone. 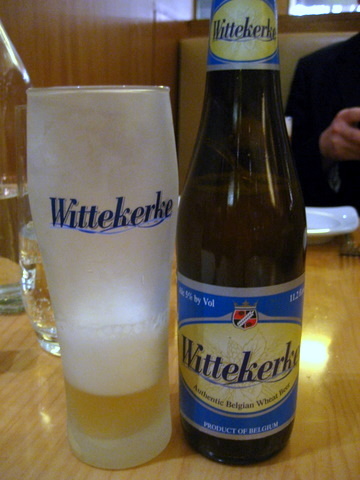 Another very good beer, with notes of cloves and fruit as well as a touch of sweetness and spice. 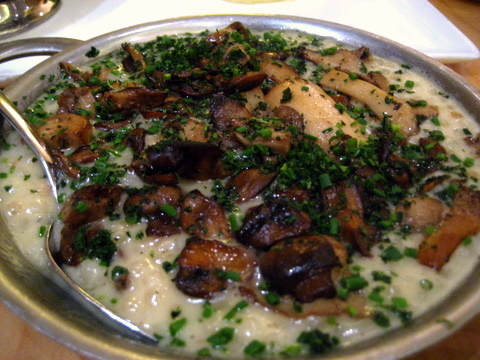 I had high hopes for this dish, the sauce of cream, wine, and cheese and the earthy savor of the mushrooms were spot on but the chewy pearls of pasta were just too firm and resistant. I loved the pasta the previous evening at Citronelle in the Lobster "Begula" but I wanted something a little less refined for the risotto. 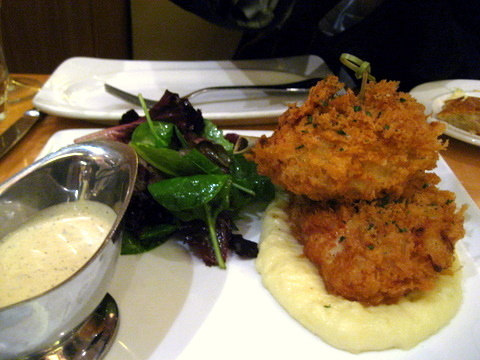 I'm not sure when fried chicken became a must order dish but I seem to get it every time I see it on a menu. We were given both white and dark meat which exhibited two very different flavor profiles. The dark meat was incredibly tender and juicy but mild in flavor. The white meat combined with the potatoes and sauce tasted like a quintessential chicken pot pie. At this point we were getting quite full so the greens and tangy vinaigrette were absolutely vital as a foil for the chicken. 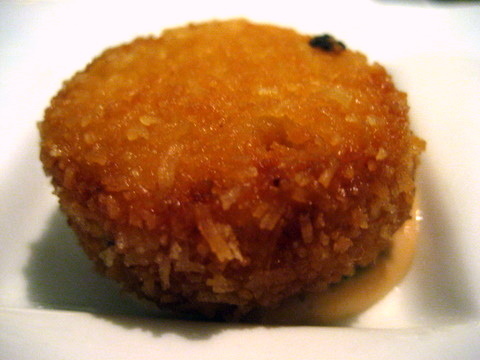 My only quibble with this dish was the uneven batter which resulted in some bites that were mostly fried flour and skin. 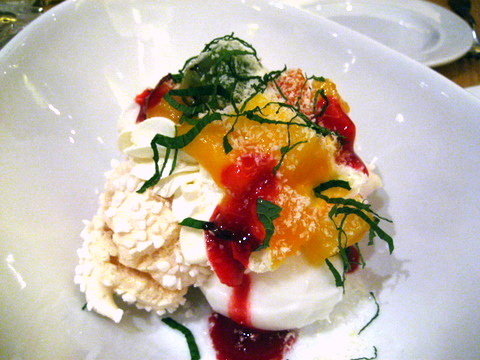 The first dessert lives up to the tropical billing, bright colors, a mix of tart and sweet fruit compliment the sugary merignue, while shredded mint provides a nice herbaceous contrast. 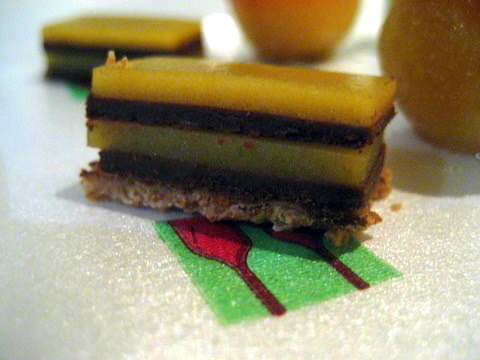 A candy bar for dessert at an upscale restaurant? You bet. 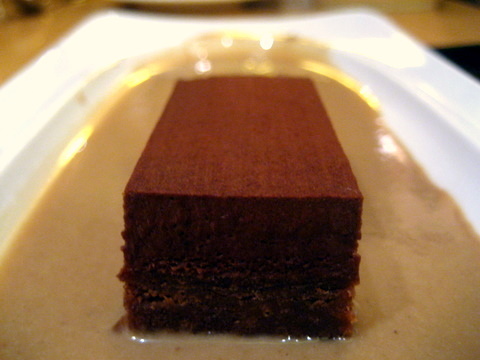 Kevin described this dessert as, "an adult Kit Kat bar that tastes like Ferrero Rocher," I can certainly see where he was coming from, smooth creamy chocolate surrounding layers of crisp wafer and a distinct flavor of hazelnut are plainly evident. By and large, Central proved to be a success, the food isn't as refined as Citronelle, but the simple flavors are satisfying in their own right and its is evident that the same level of care that goes into the food. 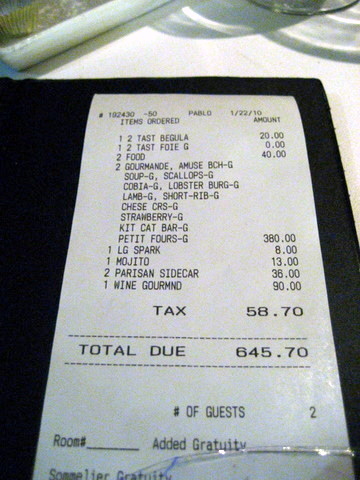 Unfortunately as I had work that night at 8:00 we didn't have much time as I would have liked to enjoy the food (10 courses in 55 minutes). 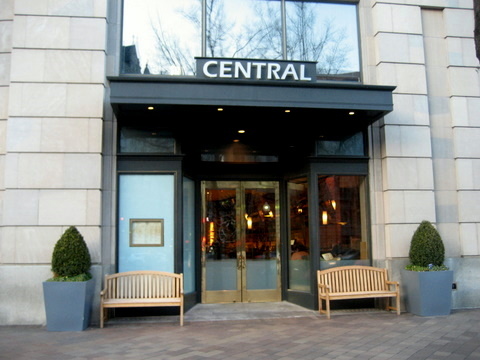 Next time I am in DC, I would love to revisit Central and give the meal the time it deserves. 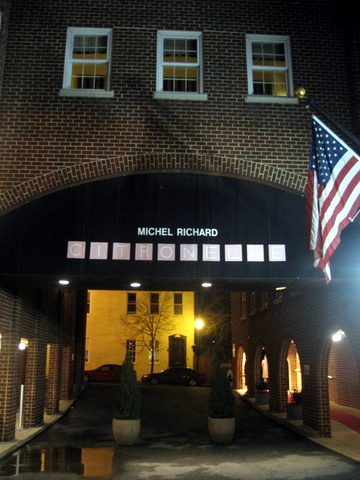 Citronelle in Washington DC is the current incarnation of Chef Michel Richard's flagship restaurant. Though Citronelle and Central are fixtures of the DC culinary landscape, Chef Richard's first stop after France was California where he opened the legendary Citrus. 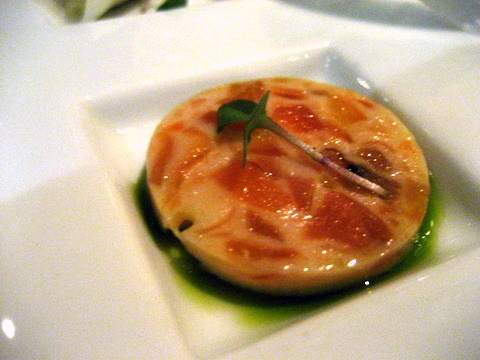 Since then he has moved steadily eastward though he had a couple of abortive returns to the West Coast the latest being a revival of Citrus, the restaurant that helped built his reputation. I have known about Citronelle for quite some time and I envisioned one day sitting down to the Grand Deugstation, but alas the menu proved to be a casualty of its own grandeur. Apparently it was rare for people to finish, and in the recessionary economy it seemed in poor taste to spend so lavishly. The restaurant is nothing to look at hidden in the bowels of the Latham Hotel. The door to the restaurant is far too humble for an establishment of this caliber and the interior is in keeping with the understated decor. 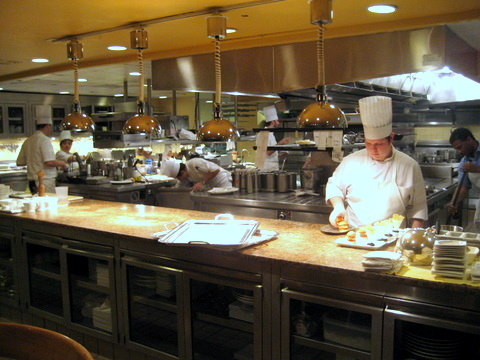 The one bright spot is the expansive kitchen, apparently a trademark fixture in Michel's restaurant. 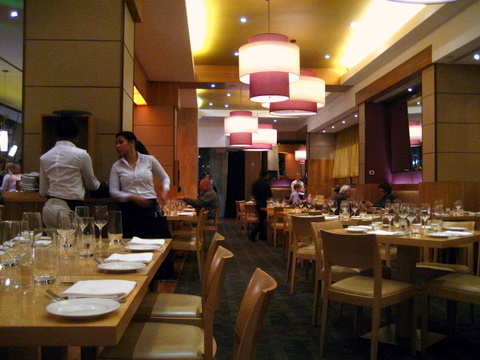 Still the blasé decor allows diners to focus their attention on the true star, the food. I opted for an old classic to start a cocktail from 1922 made up of equal parts Hennessy VSOP, Cointreau, and fresh lemon juice. 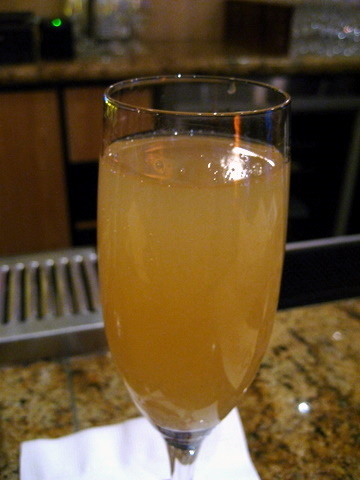 A simple refreshing drink with the orange and lemon almost totally masking the alcohol. Kevin referred to it as adult orange juice. 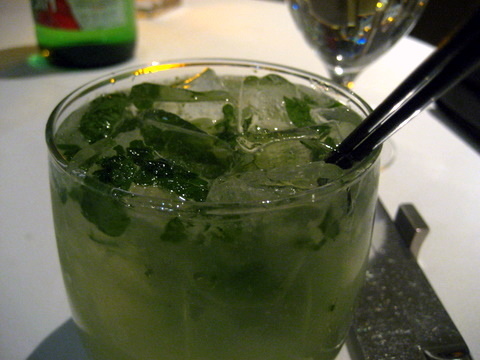 Though no longer his signature drink, Kevin still gets mojitos from time to time especially if there is something unique about them. The bubbles add a bit of excitement to what would otherwise be a very pedestrian mojito. 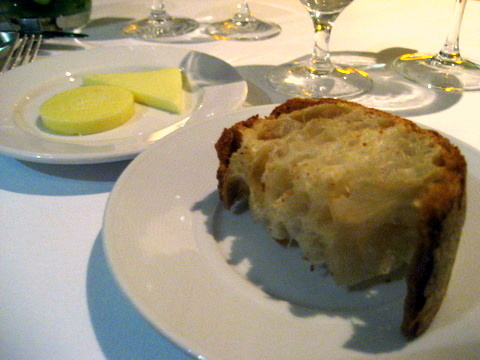 A very sophisticated preparation of sourdough, the crust exhibited a pronounced rustic toastiness while the interior was almost oily in texture; buttery rich with only a hint of the characteristic tang of sourdough. Smoked Salmon with Basil Oil - A pungently smoky preparation of salmon, the floral notes of the basil oil were critical to balancing the weight of the fish. 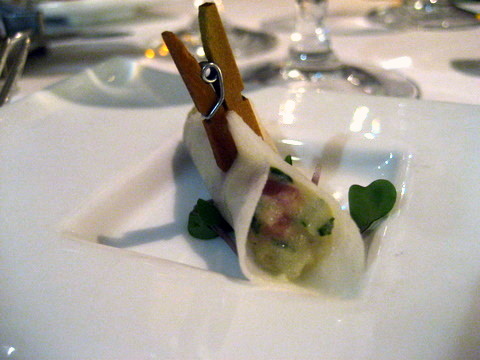 Jicama Crepe with Potato and Prosciutto - Perhaps the best of the amuses, the crispy jicama was followed up with a simple savoriness reminiscent of potato salad. 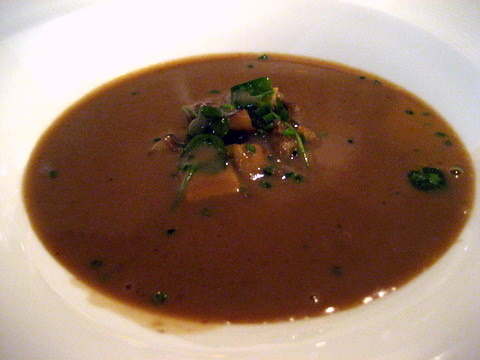 The simple moniker chestnut soup doesn't do this course justice. True the primary ingredient is chestnut, but that totally glosses over the mushrooms, sprouts, foie gras, and even peanut butter that make for a soup that delivers a hearty warmth as well as a complex flavor profile. 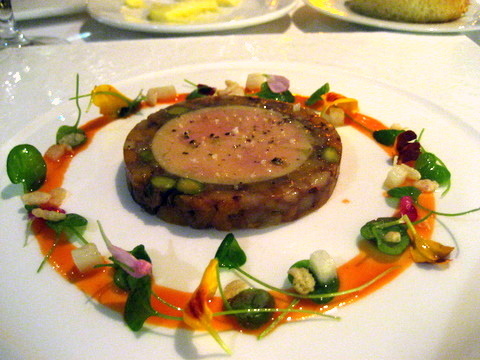 The first supplement was an elegantly shaped disc of dense foie gras surrounded by a jammy layer of preserved fruit but I thought the ring of carrot ginger emulsion, which tempered the sweetness with a slight tang, was a far more intriguing and apt companion for the liver. Periodically throughout the meal we caught intense aromas of butter wafting from the kitchen and when these came to the table I immediately knew the source. 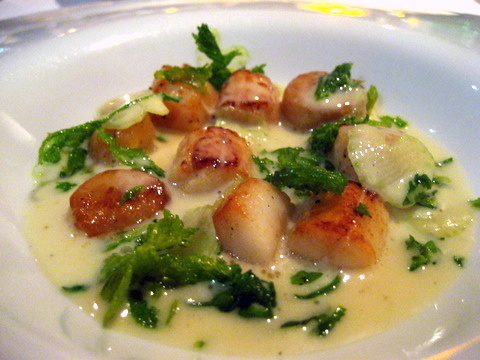 The tiny scallops came swimming in a rich overly powerful soup which I suspect is primarily clarified butter. 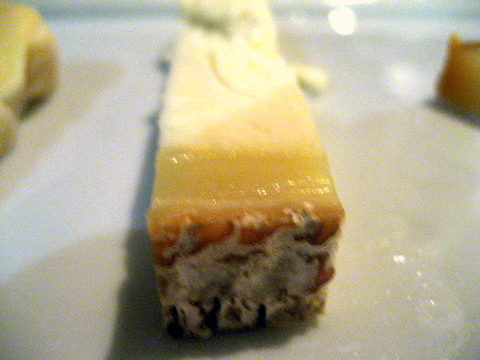 A generous garnish of celery added a nice crispness but wasn't enough to level out the intensity of the butter. Only my second experience with Cobia with the other being at Sage only a month ago. 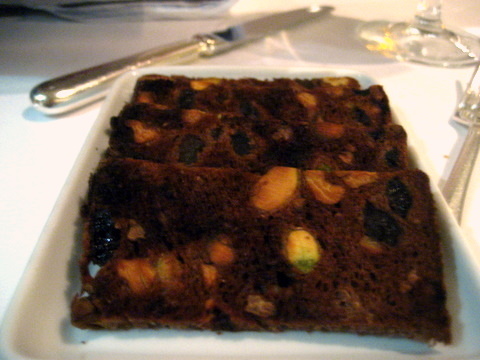 I thought this was a far superior preparation, with a exterior reminiscent of crispy skin and a dense but tender interior. 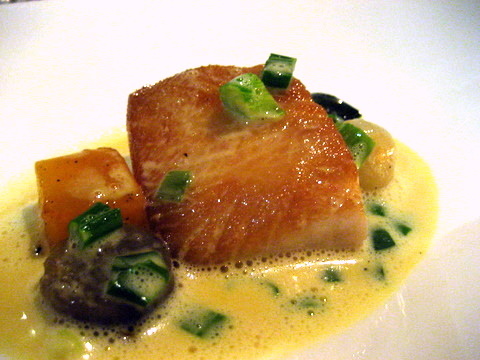 The naturally light flavor of the Cobia was heightened with the lobster-saffron broth which lent an appreciable fishiness. 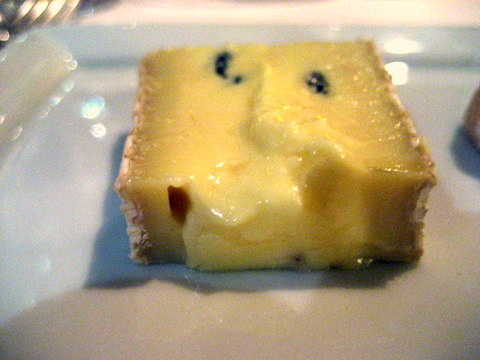 Despite Citronelle's reputation for fine dining, there is a concerted effort to keep the food lively and fun. The lounges burger offerings are a step in that direction. 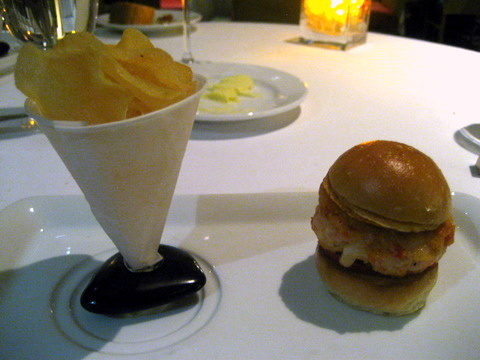 I expected something similar to a lobster roll but the flavor was a powerful almost pungent mix of lobster coral and butter. 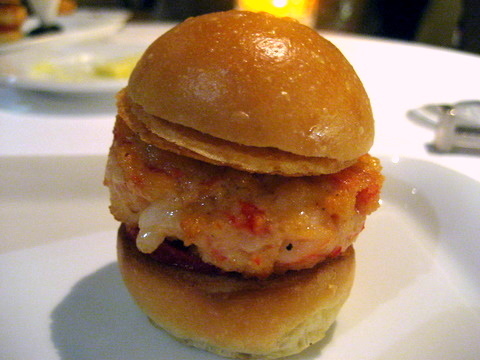 The lobster meat was a touch rougher than I'd have liked but the simple intense flavor made this quite enjoyable. The burger came with a side of the best potato chips, individually fried in clarified butter, with a delicious sweet-salty flavor. The third course in a row involving lobster. 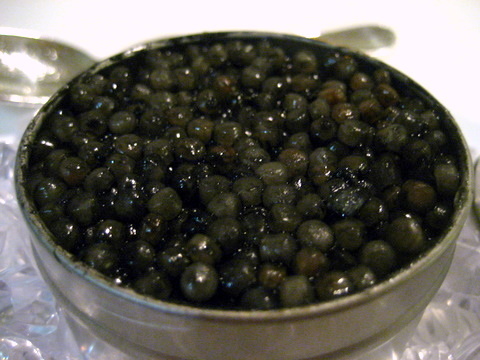 The course is comprised of lobster and a squid ink pasta that is almost visually identical to Beluga caviar. 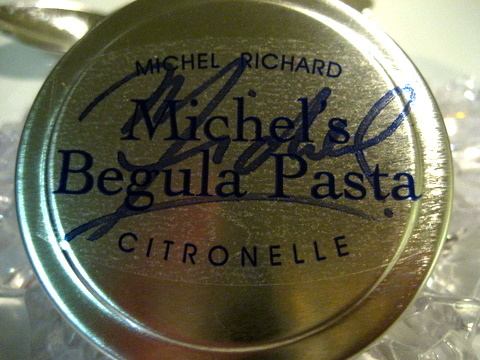 The name is the result of a misprinting on the tin that the chef found humorous. As expected the crisp sweet shellfish is masterfully prepared, paired with a firm dense pasta that provided a nice balance to the lobster. As if this dish wasn't already delicious enough, it comes with a runny egg yolk to provide a slick coating for the mixture. Wow. It's rare that a course puts me at a loss for words but the combination of the lamb and jalepeño-cumin is beyond compare. Eating this was like experiencing a culinary epiphany; of all the lamb's I have tasted this is probably the best preparation yet. 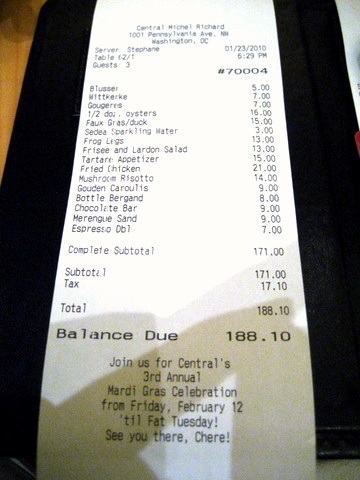 I thought it would be impossible to finish stronger after that last course but that would be selling the staff short. 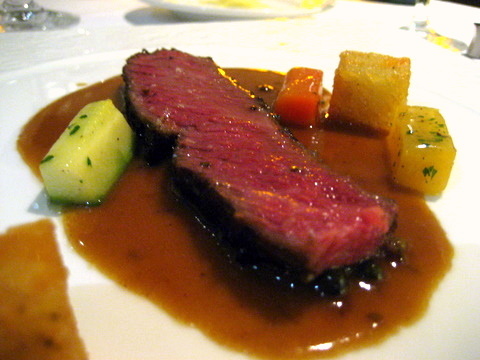 Michel's signature dish is a short rib cooked sous-vide for 72 hours. Short rib is typically a fatty cut of meat but this was quite lean, still the long cook time gave the meat a remarkably even and tender texture. The meat itself had an incomparable flavor, a simple yet undeniably delicious beefiness and a "beef jerky-like tang on the finish. I could have eaten a full helping of this despite being stuffed. 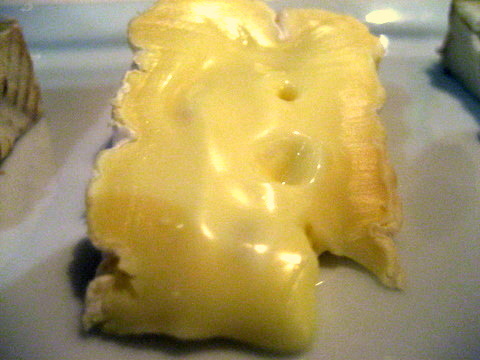 The cheese selection was delicious but fairly tame, with several well known names: Gorgonzola, Camembert, Leonara, and Petit Basque. 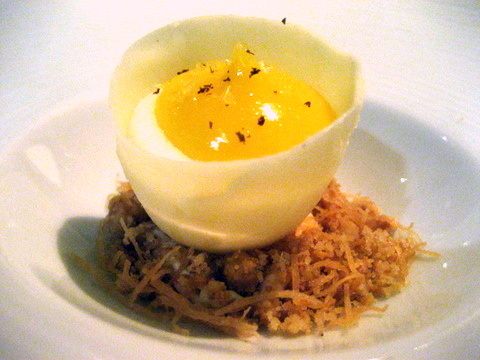 In keeping with the name, this dish was presented as a cracked egg. We were encouraged to mix the whole thing together and the resulting amalgam tasted exactly like a classic lemon meringue pie. 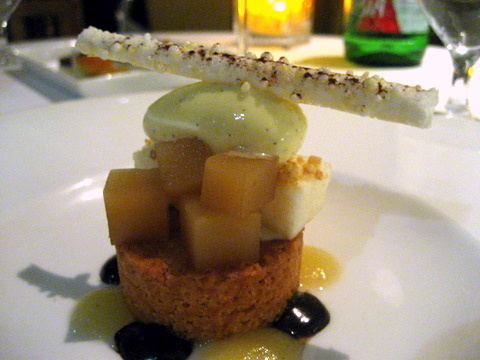 Conceptually similar to the pear and chocolate dessert I had at Saam a couple weeks ago, but so much better in terms of execution. Chocolate tends to be a stronger flavor but this dish kept that intensity in check, ensuring that the fruit and other components had a chance to shine as well. 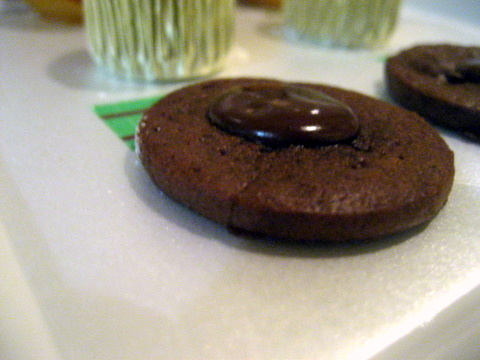 We closed the meal with four little treats, a chocolate cookie, a chocolate covered grape, raisin madeline, and chocolate-hazelnut bar. 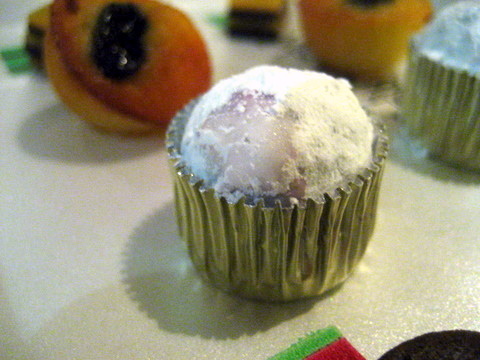 The grape was the standout, combining a bright juicy burst of sweetness with the creamy body of the chocolate. I am happy to say Citronelle lived up to my expectations and more. I know I have a tendency to be harsher on the later savory courses as I start to get full but the food here was exceptional from start to finish with some of the heavier protiens being among the best. 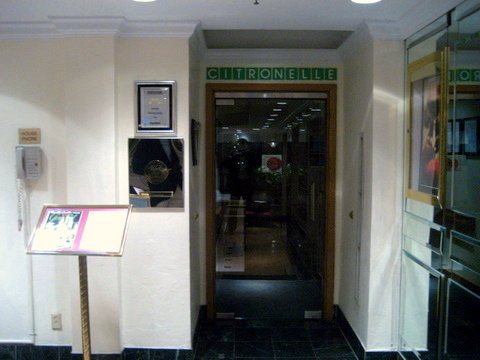 I typically wait at least a few months before returning to a restaurant but with Citronelle I was eagerly imagining my next visit before I had even left the restaurant. In fact, the strength of our experience led us to make Central, Michel's other restaurant our destination for dinner the following night.